Too many of us live our lives trying to shoehorn our many activities and responsibilities into too few time slots available. Increasingly for business people, fathers and mothers, even kids—(ineffectively) managing the myriad of activities has become an all-consuming chore. And we're so stressed that our relationships and job performance suffer. Why? Because we organize our time and our lives poorly: We spend five years of our lives waiting in lines, three years in meetings, and two years playing telephone tag! We get interrupted 73 times per day, interfering with our productivity, and take an hour of work home every night, interfering with our family time. But we can solve these problems. 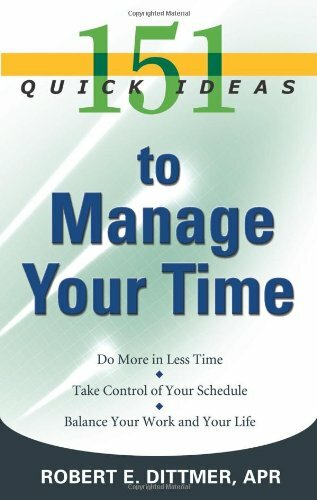 This book presents 151 quick and easy ways to meet these challenges in our daily lives. Each idea comes from the real world experiences of people like you—people who are experimenting with, examining, and discovering unique solutions to the time problems all of us face every day. Do more in less time, take control of your schedule, and create a new balance between your work and your family life. You’ll be surprised at how easy it is to take charge of your time and increase your quality of life…day by day, hour by hour, minute by minute.